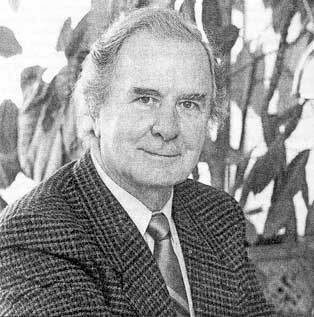 The late Charles Templeton was an evangelical minister turned agnostic and was well known for his falling away from the Christian faith. Templeton was a good friend of Billy Graham and toured with him frequently until a nagging skepticism tore him from faith and rationally compelled him to denounce belief in an Abrahamic God. When he brought these very real concerns to the floor of Billy Graham's life, Graham, though shaken, prayerfully determined that he would continue in faith. Templeton, though insisting that Graham had committed "intellectual suicide," noted that for all his perceived faults, in Graham there was "no feigning in him: he believes what he believes with an invincible innocence. He is the only mass evangelist I would trust." In an interview with Lee Strobel, Templeton expressed that one of the turning points for him was when he saw a photograph of an African woman holding her dead child, a child who died of severe drought, needing only a little rain. How could there possibly be a loving God when all they needed was rain? This infamous problem of evil and suffering, a problem that supposedly shows the maleficence of any omnipotent God that may exist was wholly incompatible with Templeton's belief in an all-loving creator. He went on in his later life to write a rare and intellectually honest book, Farewell to God, where he expresses with deep sadness and regret the untenable philosophical edifices on which his previous Christian life had been built. He was the greatest human being who has ever lived. He was a moral genius. His ethical sense was unique. He was the intrinsically wisest person that I’ve ever encountered in my life or in my reading. His commitment was total and led to his own death, much to the detriment of the world. "Well, yes,” Templeton acknowledged, “he’s the most important thing in my life.” He stammered: “I . . . I . . . I adore him . . . Everything good I know, everything decent I know, everything pure I know, I learned from Jesus. And as if his heart could bear it no longer, he bore his eyes to the ground and said, "“I . . . miss . . . him!” With that the old man burst into tears; with shaking frame, he wept bitterly. Is there any doubt that this man loved Jesus? He was wrong on so many levels. His literature damaging to and resentful of Christianity. His ideas heresy and his thoughts tangled and unorthodox. Almost everything he believed about faith and religion were and are utterly incompatible with Christianity. But there is one unshakable truth that inflames in me a great curiousity, could this man's heart, so burdened with love for Jesus, be enough? I wonder if he made it to Heaven after all and, quite frankly, I hope he did.